Beach holidays: Playa de las Vistas is a large stretch of flat golden sand and has many activities for you to try your hand at out in the water. Playa de los Cristianos is also fairly large and wide, but the sand here is of a slightly darker colour due to its volcanic beginnings! Near to lots of resorts: Holidays to Los Cristianos 2019 are almost an extension of Playa Americas Holidays, plus Costa Adeje and San Eugenio are close by too. 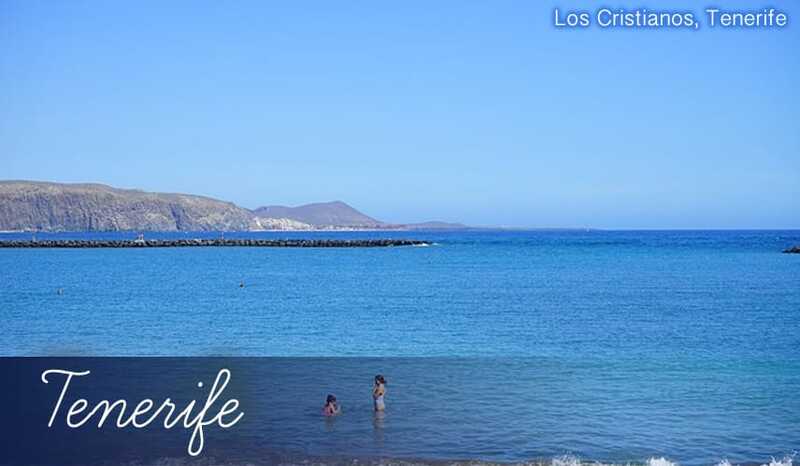 That means you get to enjoy the quieter, tranquil surroundings of Los Cristianos holidays, whilst having the option of taking a trip to the shopping centres, golf courses and bars of the larger holiday resorts. Camel Park: Located near Los Cristianos, this Camel Park offers hour long rides on the funny hump-backed creatures. Hopping on them and heading out onto golden sands you could almost imagine you’re on holidays in Egypt rather than on holidays in Tenerife! Playa de las Vistas: One of the original man-made beaches from the sixties, with golden sand imported from the Sahara desert in Africa. A very wide 500m long stretch of coastline, you’ve ample space to enjoy your sunbathing patch without bumping into others! Out to the sea there’s a good variety of water sports too. Playa de Los Cristianos: A slightly smaller beach, this also has sand imported from the Sahara, but it’s starting to become a little dusky due to the volcanic black sand underneath. The waters are clear and shallow though, and strong winds and waves are shielded by the natural curve of the bay. El Cine: This restaurant may not have the frills and decor of other fancier restaurants, but don’t be put off by that! The food here is absolutely top notch, and offers a true taste of Canary Islands cuisine during your holidays in Tenerife. The menu includes delights such as wrinkled potatoes, Fried Octopus and Swordfish. Ristorante El Piccolo: A traditional Italian restaurant which has enjoyed over 30 successful years on the Los Cristianos southern coast. Although the menu is large and varied, as expected the pizza and pasta and pasta are excellent here. We’d also recommend you give the ‘tradizone romagnola’ pasta a try, which has been cooked according to a special family recipe. The large leafy terrace overlooking the sea makes for a beautiful spot to eat too. Le Bistrot d’Alain: As you may have guessed from the name, this restaurant is unmistakably French. But don’t be put off by the menu written in French, as it offers high-end cuisine such as Roast Quail or Scallop Carppaccio. The head chef has won numerous awards, including ‘Best Foreign Chef of Tenerife’. It’s a fantastic restaurant for treating yourself whilst on holidays in Los Cristianos. Quiet holidays: When it comes to nightlife, Los Cristianos holidays are perfectly placed for those who want the best of both worlds. The local bars are atmospheric enough to enjoy a good evening out – The Clansman is a Scottish bar where you can try a famous Killie Pie (steak pie originally from Kilmarnock) with your beer. Plus, Bar 39 has become something of an institution for tribute bands and singers impersonating Rod Stewart, Buddy Holly, The Eagles and lots more. Close to all the action: If you prefer something a little livelier on your holidays in Los Crisitanos is only a short taxi ride to Playa Americas. With lots of bars and clubs all grouped into three lively areas, it’s a great place to go and party until sunrise. Huge market: Every Sunday there’s a large market held in the town centre, close to the Arona Grand Hotel. The market is incredibly popular with tourists on holidays in Los Cristianos as there are many stalls with original hand-crafted items and bargain deals on clothes – perfect for those souvenirs to take home!